Telemedicine is trending in the United States and it is widely believed that some day soon all insurance coverage will include video visits and that providers will be reimbursed in the same way they are for in-office visits. However, that is not yet the case. Coverage for telehealth still varies from state to state and payer to payer. Whether you can be reimbursed for a video visit with a patient covered by Aetna depends on the patient’s state and plan details. To date, thirty states have laws requiring private insurance payers to reimburse healthcare providers for encounters using some types of telemedicine technology. Aetna and other payers are subject to these requirements for most plans. There are some exceptions, however. Several states allow small group plans or worker’s compensation plans to opt out of coverage for video visits. Some state laws mandate that providers receive the same amount of payment for a video visit as for an in-office one of the same type. Other states leave the exact reimbursement amounts up to the insurer. Each state law also spells out the types of telemedicine that are covered. Every state that has such a law includes video visits. Several also cover store-and-forward telemedicine, but this is less common, and most do not include audio only calls. Unlike Blue Cross Blue Shield and several other large payers that have fully embraced telemedicine, Aetna takes a more conservative approach. They have partnered with TeleDoc to provide telephone consultations for non-urgent conditions for patients with certain plans. For other providers, coverage for video visits is determined by the patient’s state and plan details. If you are in a state with a parity law, there’s a good chance, but not a guarantee that you can get reimbursement for a telemedicine encounter. If your state does not have a reimbursement requirement, such a claim might be denied. Because telehealth coverage for Aetna patients is such a mixed bag, and because plans and policies change all the time, it is smart for practices to choose telemedicine software with built-in eligibility verification. The Chiron Health Rules Engine® is the most sophisticated and accurate solution available. Our experts keep track of regulations and payer policies, constantly updating the system with the latest information. Each time a video visit is scheduled, our Rules Engine analyzes the patient’s coverage and makes a determination as to whether a video visit will be reimbursed. 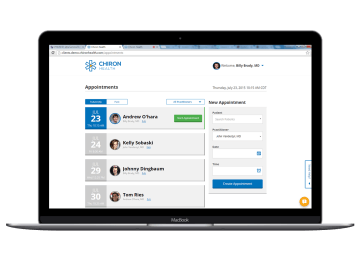 The Chiron Rules Engine® is a powerful tool for eligibility verification, but Chiron Health goes beyond technology, giving you access to a dedicated team of telemedicine reimbursement specialists who can work on your behalf to address the more complicated reimbursement situations. We’ve processed thousands of claims and use that experience to help guide your team through the red tape, saving hours on the phone. Every time we perform an eligibility check the Chiron Rules Engine® and our team get smarter. That’s why we are able to offer the Chiron Reimbursement Guarantee®. If a claim for a visit that we verify is ever denied by Aetna, we’ll work directly with them to resolve the issue. If we are unable to secure reimbursement from Aetna, we’ll pay you for the visit ourselves. Video visits are convenient for patients and a great way to grow your practice. Coverage under Aetna varies, so it is a smart idea to select a telemedicine software provider that can accurately and easily verify coverage for patients covered by Aetna. With the Chiron Guarantee, there’s no risk and no reason not to get started right away.